America has done enough harm to Iraqis already. Further intervention must be opposed. There has been no more ridiculous sight over the past week than pundits suggesting the crisis in Iraq happened because the United States withdrew its troops too soon. No attention, of course, is paid to the ways in which US policy facilitated the sectarianism now tearing apart the country. Nor is there any acknowledgement that the US ruling class and its allies are the single worst cause of suffering in Iraq since 2003 — actually, probably since at least 1991. 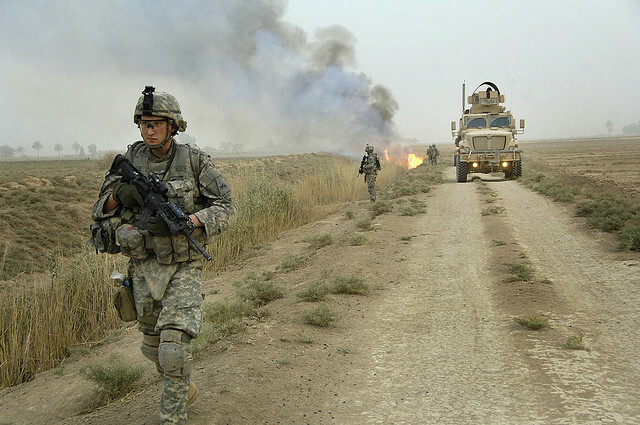 Claiming that there is violence in Iraq because of the absence of American troops defies comprehension. The 2003 invasion and subsequent occupation still scar the country. American white phosphorous use in Fallujah, for example, has led to rates of infant mortality, cancer, and leukemia higher than those reported in Hiroshima and Nagasaki. Ample evidence suggests the US used depleted uranium, as well. Tabulations of Iraqis killed by the invasion vary but respected organizations come up with shocking totals: The World Health Organization put the number at 151,000 by June 2006; the Lancet estimated 426,369–793,663 by July 2006, Britain’s Opinion Business Research counted over a million civilians. By then, torture was worse in Iraq than it was under Saddam Hussein. So suggesting American military force should be used to solve the crisis in Iraq is like recommending that a patient treat cirrhosis of the liver by polishing off a bottle of gin. While the Islamic State in Iraq and al-Sham’s (ISIS) conduct gets most of the headlines, what is happening in Iraq has to be understood at least in part as a Sunni popular uprising against Iraqi Prime Minister Nouri Al-Maliki, who has often been quite ruthless in his own right. Yet a dangerous mainstream media narrative has focused on the brutality of ISIS while downplaying that of the other actors involved. When the story is told that way, the message is that stopping ISIS is sufficient to solve Iraq’s problems. That framing of events lays the groundwork for another US bombing campaign, which will kill yet more civilians and be seen as an intervention on behalf of Shiites, which will only serve to inflame sectarian conflict. America and its allies have done more than enough to harm to Iraqis in this century and the last. Radicals in the heart of empire need to support Iraqi leftists who are struggling for a just self-rule against competing local ruling classes as well as imperialist interests. And we must vigorously oppose any further American military action so they have a chance at succeeding.